In order to get a great movie watching experience on your brand-new TV, there has to be an external speaker system in place. The internal speakers of the TV aren’t powerful enough to be heard properly and also often tend to compromise on the quality. Not only the movies, the music too sounds just terrible on them. The best solution, in this case, is to get tower speakers for your TV and have a wholesome watching experience. What would be better if these speakers can also connect to your smartphones via Bluetooth and play music via it? Most of the modern speakers are capable of supporting it. With the two-channel speakers in place, you will have a better theatre-like experience. 1) The company is a well-known brand when it comes to speaker systems of all kinds. 2) The T60X tower speakers have a wooden cabinet that brings out the best sound output from the speakers. 3) You can get these tower speakers in two colours, black and brown. 4) They can be connected to your TV via a wire and they also support Bluetooth ,NFC for streaming music from your smart devices. 5) Each speaker channel comes with a 4-inch woofer along with an 8-inch sub-woofer. 6) The remote controller makes it easier for the user to control the speakers from the comfort of their sofa. 7) A wireless karaoke function has also been included in these two speakers. 1) What company could be better for speakers than Yamaha that is known for making some of the best speakers in the market? 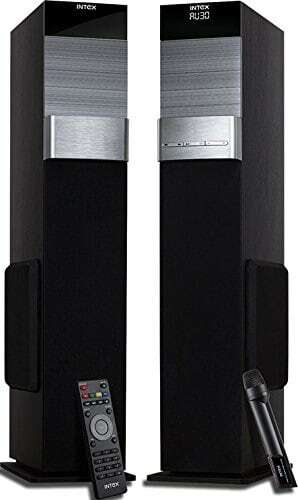 2) Their NS-8390 twin tower speaker makes to the top of our list for all the features it offers. 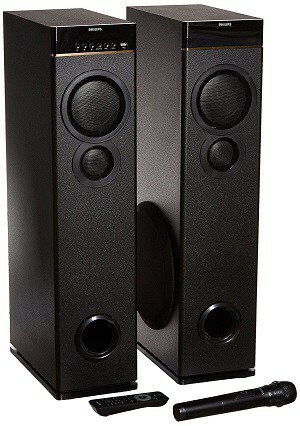 3) These are floor standing speakers that support bass reflex for a better audio experience than others. 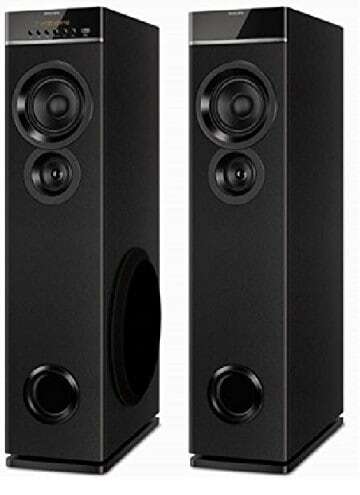 4) The twin speakers offer a great experience with the left and right channel setup and they need to be connected to an external amplifier. 5) The NS-8390 has a wired connectivity and is capable of filling a large room quite efficiently. 6) Apart from the sound quality, you’ll be getting is supported by full 2 years of warranty. 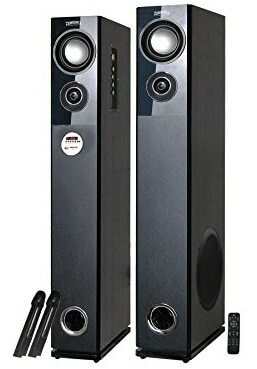 1) Coming from a company like Philips that is known for its amazing hardware, these tower speakers have to be one of the coolest. 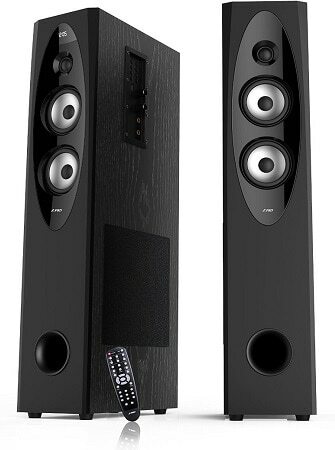 2) The twin speakers have a sophisticated look with that stealth black colour and their design. 3) With the speakers, you’ll also be getting a remote controller and a mic for those karaoke nights. 4) Besides connecting to your TV, the tower speakers can also play music via a USB pen drive and also from a Bluetooth device. 5) For the people who are still a bit old school, FM radio comes built right into it. Philips’ proprietary technology ensures much deeper bass and overall audio experience. 6) With all the thing put in space, the speakers can produce a sound of 80W. 1) This is another product from Philips that stands tall for its quality as the company is heavily invested in making audio products that offer much more value for money than most of the brands in the market. 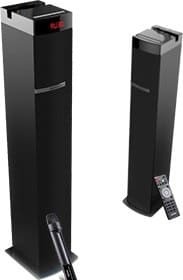 2) These tower speakers from the company will offer a best in class experience and can fill your room quite efficiently. 3) An advantage it carries over other speakers is the presence of two mic ports for the best of karaoke experience. 4) For the aesthetics of the product, these elegant speakers will add to your room and the TV setup. 5) Apart from this, the speakers do a great job of controlling echo so that all the vocals and music is crystal clear. 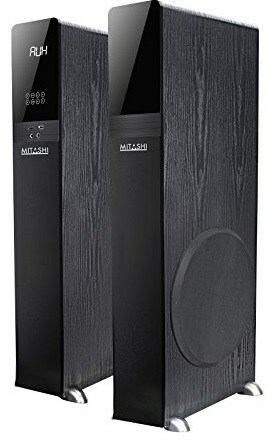 1) If you want your tower speakers to not only sound the best but also look the best, then Mitashi has got a great product for you. 2) These speakers sport an elegant wooden like the finish on the sides to make them stand out in your room. Its front portion has also been made with the same elegance. 3) There is a glass portion on the front that houses the display along with the speaker controls. 4) These are 2.0 channel speakers that offer a number of connectivity options including AUX, USB port, SD/MMC card, FM radio, wireless mic, along with the option for Bluetooth. 5) The speakers have a controller for customizing the bass and treble according to your taste. 1) Fully functional and elegant, these Zebronics speakers pack in all you can ask from a set of tower speakers. 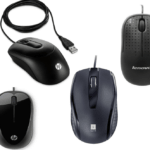 2) They have support for a range of input methods that includes USB and memory card. All the music you have got stored on your memory card can now be played directly on the speaker. 3) They also come with a microphone to help you have a great weekend with karaoke. 4) To control those two huge speakers, you will also get a fully functional remote controller with the speakers. 5) A total of 100W of sound output can be produced from these speakers. The company has a roust after-sales service network as well. 1) The homegrown consumer electronics brand is doing really good in the audio equipment market. 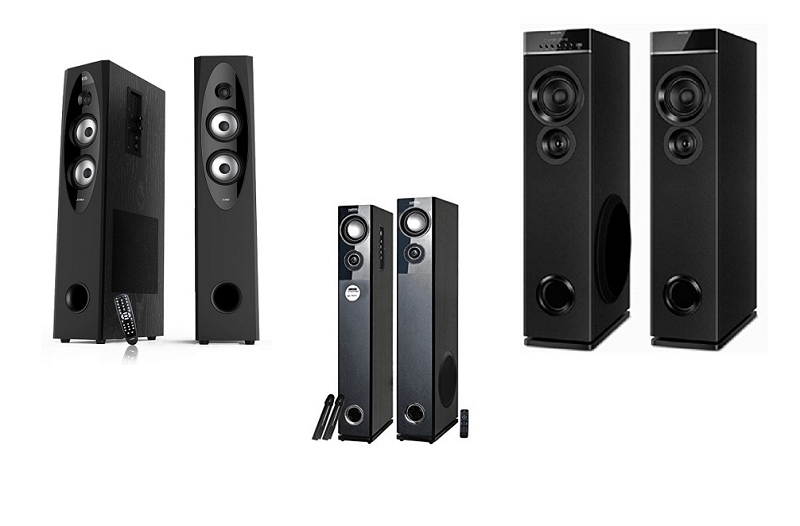 2) For the tower speakers, you can get the IT-9500 speakers that should be perfectly fine for most of your needs. 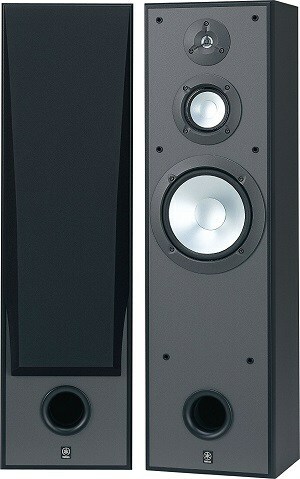 3) They have a fairly modern looking design that gives the speakers a sophisticated feel. These speakers can take input from all kinds of devices including your TV and PC. 4) To help you with the controls, there is a remote controller and the speaker has a display on the front for showing all the details. 5) Cordless mics are supported by the speakers and you can even play FM radio on it. Echo knob is present on the speaker to control the echo from the speaker. 1) Starting with how they look, Intex has given these tower speakers a more of an industrial look with all the metal portions on the front. 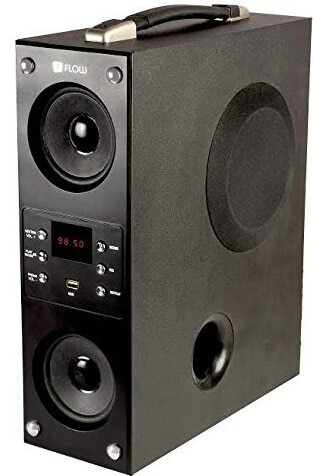 2) The design of these speakers is different from the one mentioned above. For the feature set, you will get the features that are more or less standard on all the tower speakers in the segment. 3) A remote and mic come included with the speakers and the speaker is capable of controlling the mic volume along with the echo. 4) There is a list of connectivity options the speakers support out of the box and you can use them with your DVD player, PC, or TV. 1) In case you’re wondering, this speaker is for the people looking for something on a tight budget. 2) First of all, this is a single tower speaker and not a 2.0 channel one but is capable enough to take on a much larger system. 3) This speaker can easily be the centre of your party and could fill a large space with those songs. 4) The speaker ensures a top-notch sound quality with its wooden built, which is an absolutely perfect material for making speakers. 5) It is simple to use and everyone in your family can enjoy it. You can input audio to the speaker using a number of sources. 6) Another advantage of a single speaker is that it won’t take a lot of space. 1) The same brand has an option for the people with an even lesser budget, but they don’t want to compromise on the sound quality. 2) Packing a similar speaker like the previous one, this mini speaker measure just 1.2 feet in height, you can place it pretty much anywhere in the room and have a great sound experience. 3) Flow hasn’t compromised on the build quality and this mini speaker also comes with a wooden build. 4) This ensures a superior audio quality that has deep bass and treble. Like its bigger brother, this mini speaker can also take audio from a number of sources. 5) It also supports wireless mic and can stream music directly from your smartphone using Bluetooth.